The book is designed to resemble a deluxe fashion magazine. From my own experience I find that patients prefer to read current magazines in a reception area and we have designed the book in magazine form to be fresh, exciting, and appealing. 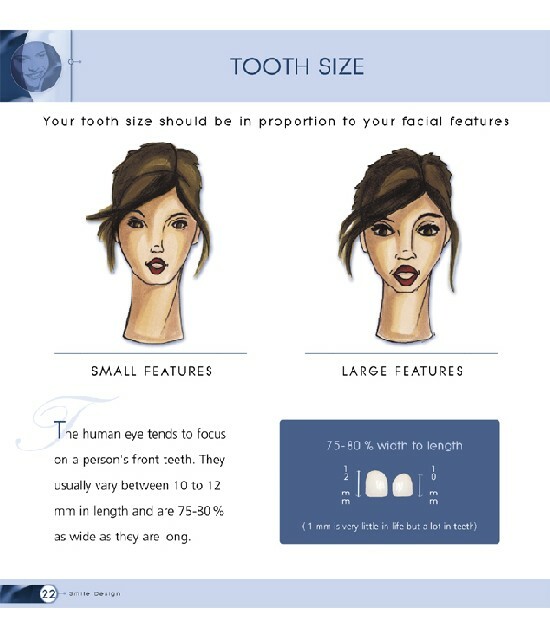 We wish to provide esthetic dentistry to our patients and so the book displays the magical changes we can accomplish. The book has been formulated to be used as two books in one and when left on a table in your reception area always appears to be facing upwards expressing to your patient that they are present in an esthetic dental office. Esthetic Dentistry shows before and after pictures in a logical sequence demonstrating the possibilities of esthetic dentistry. Various scenarios are presented and your patient can usually relate and placed themselves in one of them. The language is simple, short, to the point, and designed for reception area browsing. Interspersed amongst the cases are pages resembling fashion advertisements with a call to action asking the patient to ask you, the artist, how you can help them. 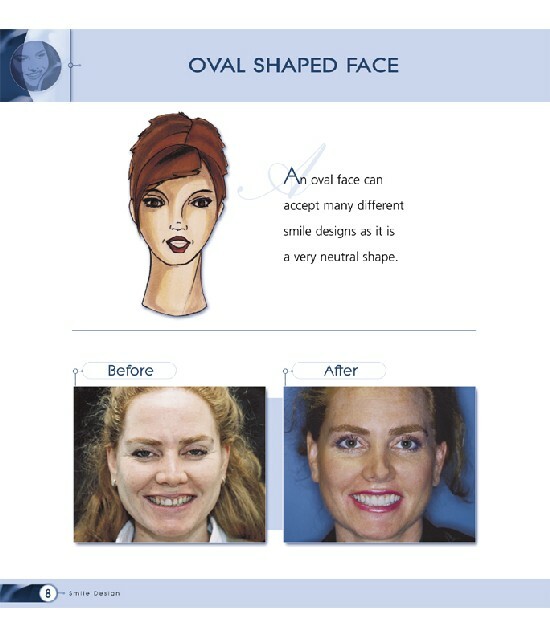 Smile Design shows your patient how you, their esthetic dentist, can change their facial form and enhance or hide various facial traits by manipulation of tooth position, shape, etc… The concept of conveying personality through tooth shape is introduced. Did they ever think that esthetic dentistry could possibly change their lives? What can you, their dentist, do to help them? 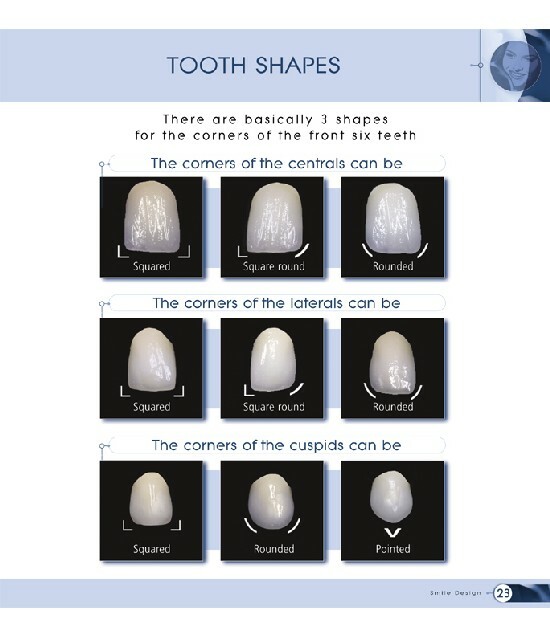 Yourself and your entire dental team should be thoroughly familiar with what is presented in the book. The cases are simple to understand and are logically presented. Use them to explain whether orthodontics is necessary, or if the gum line needs to be modified, the use of dental implants, and the concept of complete dentistry. Certain cases are broken down into easy to follow detail so that you can explain to your patient the way in which someone just like them solved their dental problem. People visualize much easier when they are able to relate to others and photographs are a simple way to open the door to complex treatment which otherwise may be verbally difficult to introduce. Your patient is shown how and why he must undertake certain procedures to achieve a desired result. Patients often worry about what their temporary restoration will look like! Photographs of provisional restorations are included with many of the cases so that your patient can see and be assured that the temporary should be esthetic and a preview of the final restoration. Provisionals take the mystery out of esthetic changes.